Rubber Hot Water Bottles have always been in common use. The insulation properties of the rubber, which goes into the production of Hot Water Bottles, enables the Bottles to retain heat for a long time. These Hot Water Bottles are used for different purposes, particularly to cure a few minor pain ailment such as back, muscle cramps, etc., etc. In order to ensure safe and reliable use, high quality raw material goes into production of the GPC Hot Water Bottles. 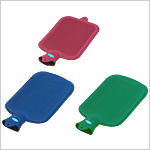 Send Your Buy Requirement For "Hot Water Bottles" AND Get Quote Quickly.